Diagnostic error poses a significant threat to patient safety. According to a 2007-2013 closed claims analysis from The Doctors Company, missed or delayed diagnoses are responsible for 57% of malpractice claims in emergency medicine. 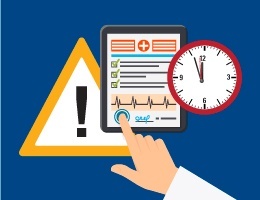 Before we can design patient safety initiatives to address diagnostic error in our organizations, we must first understand the breadth of the issue. This infographic outlines the scope of diagnostic error and breakdowns in the diagnostic process that can lead to error.